New Japan Pro Wrestling's New Beginning USA tour began at the Globe Theatre in Los Angeles, California on Wednesday night. 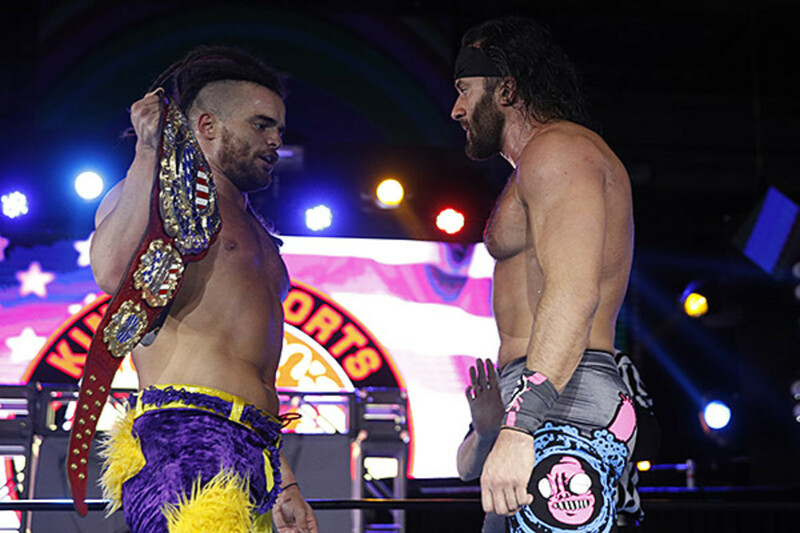 The three-show tour was affected by the United States' government shutdown, with NJPW unable to get visas for their Japanese wrestlers in time. - Katsuyori Shibata did the pre-show greeting with Karl Fredericks (from NJPW's dojo in California) in the ring with him. He apologized for the issue with the visas but said they and the U.S. dojo all have NJPW in their soul. - Alex Coughlin vs. Clark Connors ended in a 10-minute time-limit draw. KES pinned King after hitting the Killer Bomb. Cobb hit Tour of the Islands to win. Finlay superplexed Chuckie T through a stack of chairs and hit Trash Panda for the win. This was promoted as a one-night reunion of Beretta & Romero as RPG Vice. Robinson hit Pulp Friction on Romero and pinned him. Robinson and Beretta went face-to-face after but shook hands ahead of their title match in Charlotte on Friday. Robinson closed the show by apologizing for the visa issues and thanking the fans.